But some people are puzzled about that strange tangerine-colored thing on the side of the Celebrity Edge. Do you know what it is? I’ll admit that it looks like a piece of construction equipment accidentally left behind on the ship. However, the colorful object actually has a purpose other than being an eye-catching design feature. Don’t look at the answer below until you’ve formulated your own response. Congratulations if you are correct. If not, might be time to book a Celebrity Edge cruise and experience the Magic Carpet yourself. (Answer) That bright tangerine structure on the new Celebrity Edge is the world’s first cantilevered floating platform. It actually moves up and down on the exterior of the ship to reach heights of 13 stories above sea level. Although it might look like lifeboat orange, Celebrity says the color of the metal mechanical structure is tangerine. When it’s up on Deck 5, the Magic Carpet is a restaurant offering unforgettable al fresco dining as the ship glides over the glistening water below. When it is on Deck 14, it serves as a late-night bar. When it’s down close to sea level on Deck 2, the Magic Carpet becomes a comfortable and fun way to board a tender for a shore excursion. 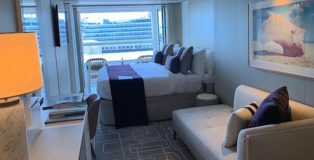 Instead of the unpleasant process that happens on most cruise ships when boarding a tender, the Edge has a luxurious lounge where passengers can relax before stepping on or off a tender. For those who thought the Magic Carpet may be a fancy elevator that passengers ride up and down – no way. 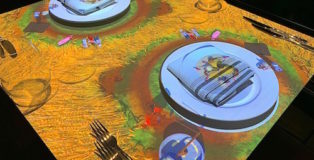 Passengers will never be on the Magic Carpet when it moves. Nor will the ship cruise when the Magic Carpet is down functioning as a boarding area for the ship’s tenders. The Magic Carpet is not constructed to be seaworthy when the ship is moving. By the way, those Edge tenders are large and comfy. No cramped hard wooden benches to sit on like some other cruise ships offer. The Celebrity Edge tenders have relaxing upholstered chairs, TV screens and large windows to watch the seascape coming and going. When we returned from our short tender trip, we stepped off the tender onto the Magic Carpet where we were greeted with cold drinks and snacks. 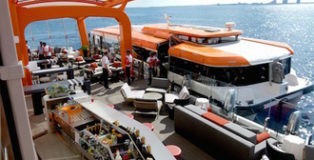 Hope other ships follow the Edge’s lead and make the necessary tender cruises for shore excursions a more leisurely and happy experience rather than the unpleasant cattle drive that many passengers dread. Way to go, Celebrity Edge!